Discussion in 'Videocards - NVIDIA GeForce Drivers Section' started by Cyberdyne, Apr 11, 2013. NEVER add features that you do not already have. One, newer then what is currently available and you simply want to try it. It can be interesting to see if fixes or other announced features are included. days before it was officially added. in a new branch that we don't have yet. GPU's. Thus the existence of laptopvideo2go. every so often some old game or deprecated program. future drivers should be simpler. CTRL+F is your friend. 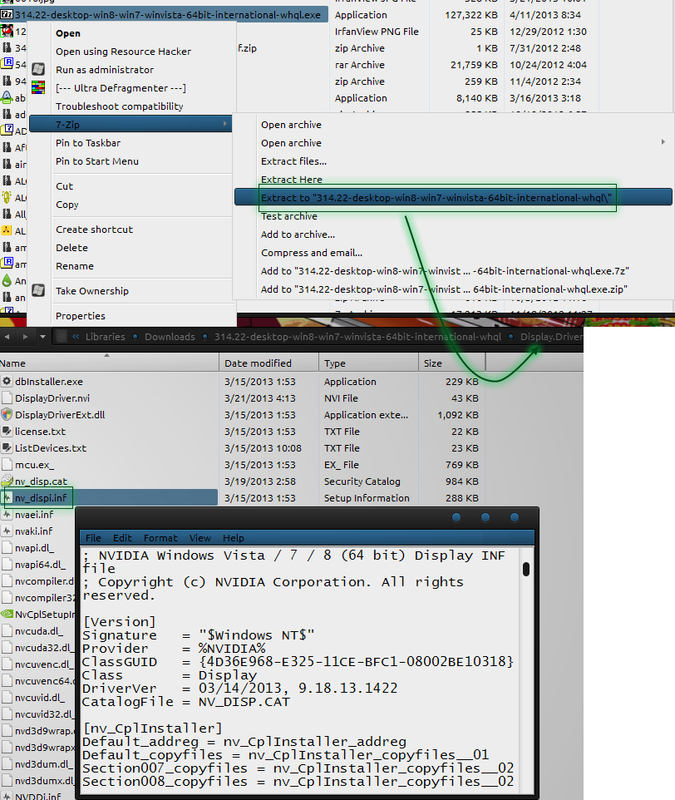 Inside the extracted driver folder open Display.Driver. "nvts.inf", "nv_dispwi.inf", or "nv4_dispi.inf" instead. Search (CTRL+F) for your GPU (for myself it's GTX 470) in the pastebin link below. 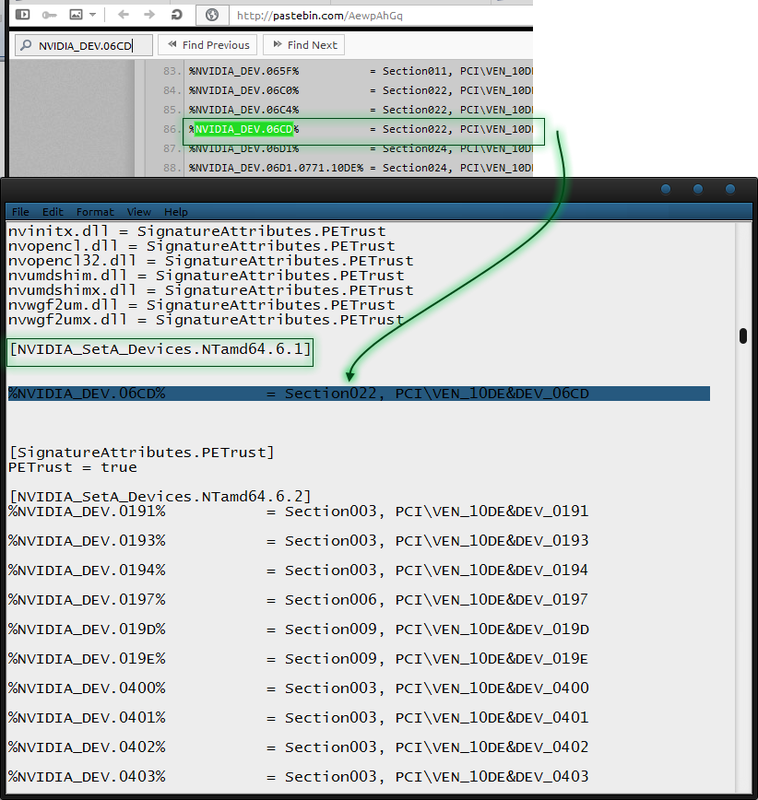 and paste it in the [Strings] section located toward the bottom of the INF you are modifying. GPU string) and search (CTRL+F) for it in the pastebin link below. Copy the line you find it in. Save it and you're done. Launch the "setup.exe" from the driver folder and it should start perfectly. Click the Start Start menu and select Settings. Go to Update and Security. Once in Windows, continue with driver installer. NVIDIA_DEV.06CD = "NVIDIA GeForce GTX 470"
That's it. It's really only copy and pasting two things. the strings in the strings section, and paste all the device ID's in all three OS's sections. can always grab your GPU's code from a drive that already supports your GPU. you tried the guide and it did not work tell me what part confused you. Cilene, AQUILES and GroinShooter like this. Something like this would of came in handy a couple years ago when I was getting into driver modding. Nice work! We previously had sticky on this subject, I wonder what happened to it? I have no idea. It disappeared at some point. Can't even search to find it. It was outdated anyway. And it was not really a guide, it didn't really teach you anything. 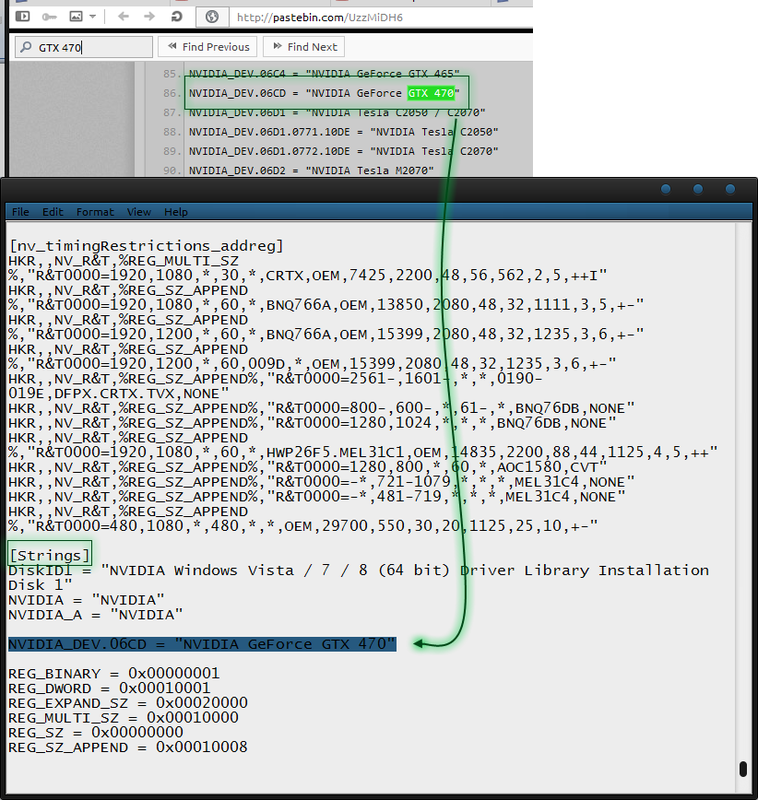 BTW, when people make modded INFs for drivers (aka leaked/quadro threads), they simply paste all the strings in the strings section, and paste all the device ID's in all three OS's sections. +1 for sticky. There are at least a few requests for modded .infs each time a new driver is released. This should help a lot of people out. I should add that if you're using Windows 8 you must disable Driver Signature Enforcement if you want to install a Quadro driver. I see that question come up a lot along with the inf requests. Right click bottom left hand side of the screen and select "Command Prompt (Admin)" and enter "shutdown -o -r -t 0"
Yeah it didn't. Your guide not only is up to date, but easier to follow for those who don't know how to mod their own drivers. You should see if a mod will sticky it. Was the 1st (old) thread which is now gone¿ also from you? Filename isnt always nv_dispi.inf. At least some of the older drivers have nvts.inf and I think some of the quadros have some other filename. You can always change the file name once you mod the inf as everything else is the same. I have never claimed otherwise. I wrote it to hopefully make the guide a little bit better. @Prophet; Yeah, I'll mention that. @yosef019; ok, I added relevant information for XP. I've never actually modded XP drivers, so if you do it (or have done it) let me know if I added the correct info. I know, just commenting on the fact you can change it. I did a similar guide for NBR, in my case it is for a GTX 680M. It does contain helpful screenshots though! You can find it in the lower section of the first post. I added some supplementary pictures. The only thing you can do is think of yourself as a complete noob reading the guide. Would it be easy to do if you had hardly any knowledge? All you can do is make that process as easy as possible. Yeah, that is what motivated me to simply put the individual list's of strings and device ID's on pastebin, and tell you what to search, what to copy, and where to paste it while using myself as an example. I've done pretty well at explaining things in layman's terms in the past. But you never really know until someone gives the guide a go.